President Trump defended his nominee to the Supreme Court in a Montana rally. 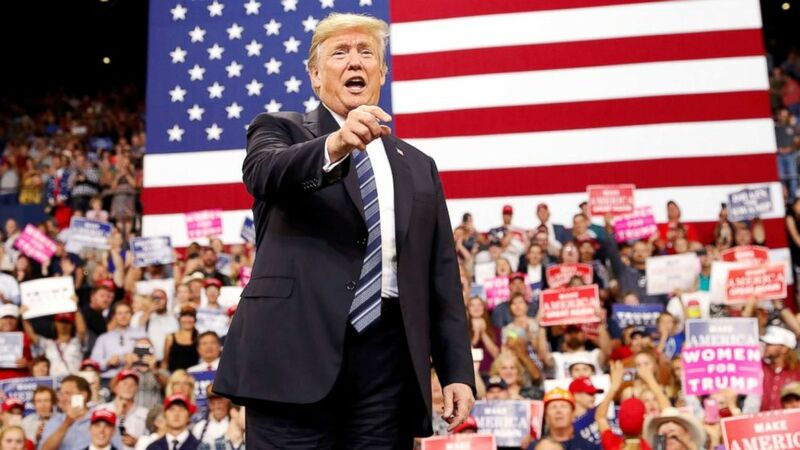 Speaking to supporters at a campaign rally in Montana on Thursday, President Trump went on the offensive against Democrats over what he described as "sick" attacks against his nominee for the Supreme Court, Judge Brett Kavanaugh. "He’s doing really well," Trump said, acknowledging Kavanaugh's tense three days of confirmation hearings in front of the Senate Judiciary Committee. "But do you believe the anger and the meanness on the other side? Sick, it’s sick!" Trump took the stage in Billings tonight and appeared to be in cheerful spirits as he launched into a montage of searing attacks against Democrats, the 'deep state,' Jon Tester, the media, and critics who have questioned his fitness for office. 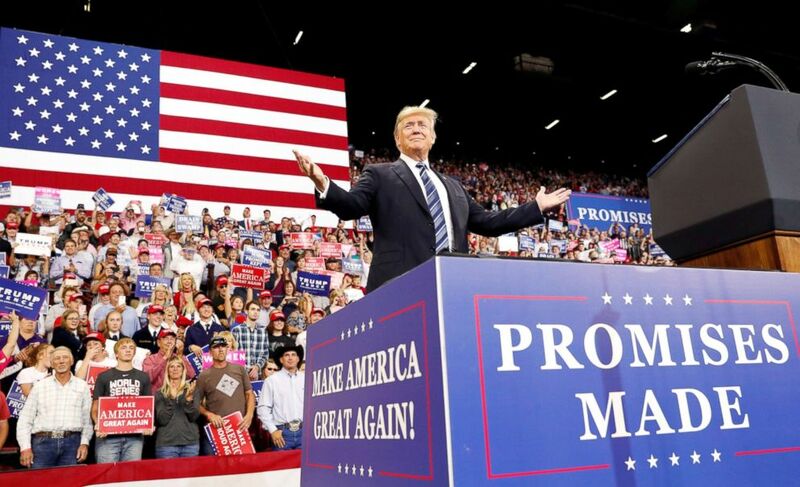 During the rally, the president went on a more extended, scripted rift on the "deep state" following the New York Times’ op-ed by the anonymous senior administration official claiming to be part of an anti-Trump resistance. (Kevin Lamarque/Reuters) President Donald Trump greets the crowd as he arrives for his "Make America Great Again" rally in Billings, Mont., Sept. 6, 2018. "Nobody knows who the hell he is. Or she. But they said he. But probably that’s a little disguise," Trump said. "Unidentified deep state operatives who defy voters to push their own secret agendas are truly a threat to democracy itself. And I was so heartened when I looked, I think it’s backfired." Speaking of Democratic lawmakers who have threatened him with impeachment if the party takes back the House, the president seemed to indicate that the subject had been on his mind lately as he warned his supporters what it could mean for the future of the country. "If it does happen it's your fault, because you didn't go out to vote," Trump said, after warning it would turn America into a "third world country" where every following president would likely be impeached for political purposes. "Today’s Democratic party is held hostage by haters, absolute haters, left wing haters. Angry mobs, deep state radicals and their fake news allies, those people are the best," Trump said. A notable contrast though, was President Trump's willingness to blast his domestic political opponents as "sick," even as he lavished praise on two brutal dictators, Russian President Vladimir Putin and North Korean leader Kim Jong Un. "[Kim Jong Un] likes me, I like him, who knows what is going to happen!" Trump said. "One of my best meetings ever was with Vladimir Putin, and they said 'He was too nice,'" Trump told the crowd. "They wanted me to have a boxing match on this stage." Even as the president ginned up the crowd to boo the media, he lavished praise on Rep. Greg Gianforte as a “fighter” despite his conviction last year for assaulting a journalist. "He's fought in more ways than one for your state," Trump said. "He is a fighter and a winner." 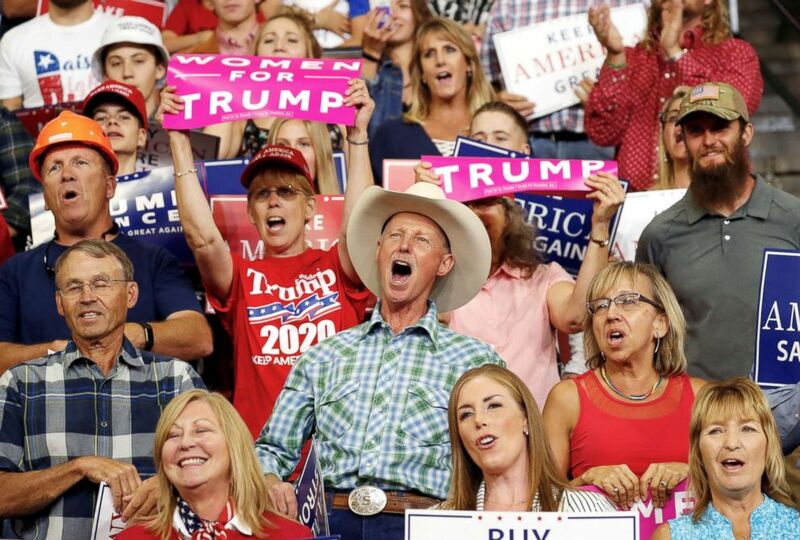 (Kevin Lamarque/Reuters) Supporters react during President Donald Trump's "Make America Great Again" rally in Billings, Mont., Sept. 6, 2018. The president fumed as he recounted Sen. Jon Tester’s treatment of his former personal physician, Adm. Ronny Jackson, who withdrew himself from consideration as VA Secretary after allegations surfaced that he fostered a hostile work environment while serving as head of the White House medical unit. "One of the saddest things I’ve seen is when Jon Tester -- and what he did to a great, great man Adm. Ronny Jackson," Trump said. "Adm. Jackson was subjected to horrible lies and smears, and I’m a victim of that too but I’m kind of getting used to it. At least it’s my job. I guess I’m a politician. Think of it!" Trump seemed to brush off reports he’s furious over the New York Times op-ed, and suggested he’s instead been screaming and raving over trade negotiations with Canada. "They had me stomping around screaming with anger up in my area of the White House where I live with my wife and son, Barron. They had me screaming, shouting like a lunatic. I had six people in my office, I was in the oval office, we are having a talk on trade, it actually happened to be trade with Canada. And they said 'Sir, you are not up there screaming and ranting and raving. You're here talking,'" Trump said. Before taking the stage at his rally, President Trump joined Fox News' Pete Hegseth at a separate side platform in the arena for a 10-minute interview. The president again unloaded on the New York Times following its Wednesday op-ed. "Well number one, The Times should never have done that because really what they've done is virtually, you know, it's treason," Trump said. "You could call it a lot of things." The president added that he's more frustrated about the anonymity, because he believes it's easier to discredit something negative written about him when the author isn't anonymous, alluding to several books published in the past year that have painted the White House as on the brink of chaos. "When somebody writes and you can't discredit because you have no idea who they are, usually you'll find out it was a background that was bad, it may not be a Republican, it may not be a conservative, it may be a deep state person that's been there a long time," Trump said. "We don't know where -- it's a very unfair thing, and it's very unfair to our country and the millions of people who voted for us." (Kevin Lamarque/Reuters) President Donald Trump greets the crowd as he arrives for a "Make America Great Again" rally in Billings, Mont., Sept. 6, 2018. The president then was asked about his recent threats that he might try and shut down the government over funding for his proposed wall along the U.S.-Mexico border prior to the midterms, but seemed to settle on waiting until after the election is over. "So most likely I will not do that but we’re going to do it immediately after the election," Trump said, adding he had a "commitment" from Paul Ryan, Mitch McConnell and other congressional leaders to help push for a shutdown. 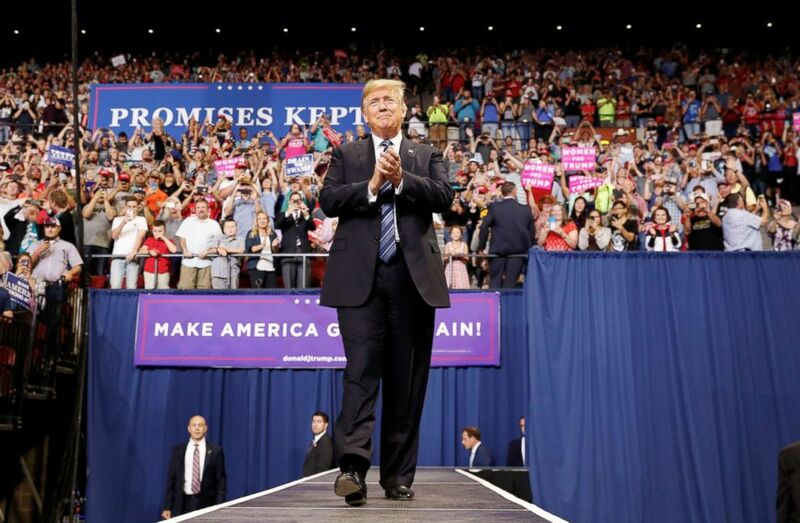 Trump's visit to the state is the latest swing in what he has promised will be an aggressive effort on behalf of Republicans leading up to the November midterms. Democratic Sen. Jon Tester is looking to fend off a challenge from state auditor Matt Rosendale, who has cozied up with Trump's agenda in a state that Trump won in 2016 by 20 points.